When you open the pages of a new cookbook, that first recipe can make an important statement. That certainly happens in The Cardamom Trail by Chetna Makan. 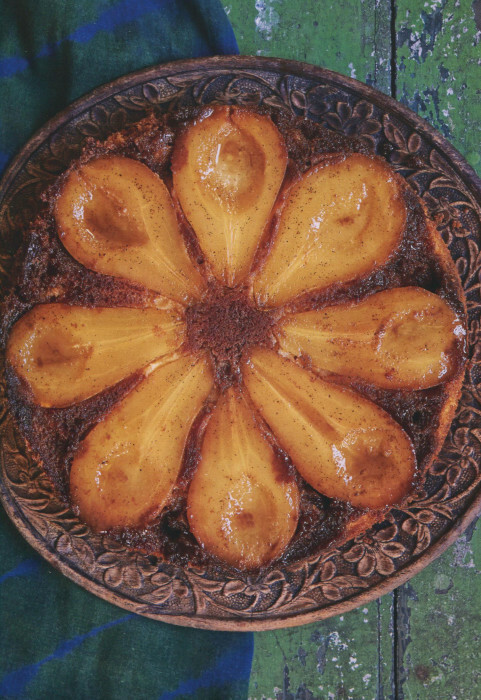 This upside-down cake is a beauty to behold, exotically rich to the eye and surely to the palate. I happen to be a sucker for upside-down cakes. I’m not sure what it is, perhaps the “surprise” when it comes out of the pan, but these cakes always seem to be a very special, very personal treat. And, at her cooking school Cooking by the Book, Suzi keeps finding that any “upside-down” recipe is a winner. When she has one on the menu, it’s almost certain a group, gathered in our kitchen to cook a meal together, will select that upside-down cake option. And, when it is ready to hit the plate, everyone in the kitchen gathers around to watch dessert almost magically appear. Here the “upside-down” adjective is coupled with caramel. What else is there to say? For many more lovely dessert ideas, do look for your copy of The Cardamom Trail. You can read my full review here. The book arrives on the shelves of US bookstores next week. But, even before you buy your copy, you can get a head start this weekend with this cake that will make your meal end right-side-up. Preheat the oven to 350°F. Grease a 9-inch round spring form cake pan. First, make the topping. In a saucepan, gently heat the butter, sugar and ground cardamom until the sugar has dissolved and the butter has melted. Cook for 2 minutes, stirring often. Pour this sauce carefully into the prepared tin and spread it evenly over the base. Sit the halved pears in it with the cut sides facing down. To make the cake, put all the ingredients in a large bowl and mix with a handheld mixer for 2 minutes until light and creamy. Carefully spoon this mixture over the pears, taking care not to disturb them, then bake for 50-55 minutes until a skewer inserted into the center of the cake comes out clean. Leave to cool in the tin for 10 minutes, then carefully turn out on to a wire rack. Enjoy warm or cold. The cake will keep in an airtight container for up to 4 days.